The J Rockett Animal is the best overdrive pedal I've ever played. There, I said it. Of course by "best" I mean the one that works best for me, right now. I've been playing for over 35 years and my notion of "ideal tone" has continually evolved, but for what I want at this point in my guitar life, it's as close to ideal as I've found. Its overall tone is, as advertised, very Marshall-esque. It can really ape an old metal or plexi panal Marshall very well. I own one of those vintage amps and have played dozens of others, so I can speak with some authority on that. What I like about the Animal is that, with the Snarl switch off and the Bass and Treble controls set properly, it's very balanced sounding - there's no mid-hump, scoop, or other obvious EQ anomaly going on. Unlike the OCD that I've been using for years, it's very open-sounding. And there's plenty of output to use it as a clean boost, if you want to do that. I love the character of the distortion. It sounds great at both low and high gain settings. Unlike, say, a Tube Screamer, it's raw, but not too raw. The clarity and harmonic overtones are very nice, with no weird harshness or dissonance so chords with extended voicings sound coherent. Low strings sound sufficiently tight, while high strings sound sufficiently fat – like I said, very well-balanced. Best of all, the distortion is extremely touch-sensitive. It's as responsive as the English Muff'n which was my previous champ in that department. You can play the Animal like an old school amp, leaving the pedal on and rolling back your guitar volume for clean tones. And those clean tones are nice; not at all woolly sounding. I've read some posts on Internet forums complaining about the noise levels of the Animal. While it may be a little more noisy than other pedals when you crank up the Gain and Treble controls, it doesn't seem unreasonably so. Let me put it this way – I wouldn't feel like I needed a noise gate or anything. Also, I get the best tone by setting those controls moderately anyway, so it's a total non-issue for me. I've also read some talk about "clean bleed" on the Animal. Some people are hearing clean signal mixed in when they stack the Animal with another overdrive pedal. To be honest, that doesn't make much sense to me. I can't see how one pedal would cause that behavior in another. But accepting that claim at face value, I can tell you that my Animal does not exhibit this behavior. I'm using it stacked with the Voodoo Lab Giggity as my go-to lead tone, so I've spent a lot of time listening to the Animal in that configuration and I'm not hearing any sort of "clean bleed". The Bass and Treble controls do not have a wide boost/cut range, and are most useful for fine-tuning the sound to the guitar and amp being used. To me that's a good thing because there's not a bunch of unusable range in the two controls. There's no mid-range control, but by setting the Treble and Bass appropriately, you can fake it well enough. The secret weapon in my opinion is the Snarl switch. Flip it on (in the up position), and it adds a small upper-mid boost and a slight increase in gain. The effect is subtle but significant. Essentially it sounds like a vintage Marshall goosed with a clean boost pedal. It's more aggressive and rockin' with the Snarl switch on. In my opinion, it transforms the Animal from a plexi-in-a-box to an EVH-in-a-box, which is a lot of fun. Every time I turn it on I can't help but play every Van Halen lick I know. It apes that sound really well. Okay, so this review is positively gushing. Is there anything I don't like about the pedal? Maybe a couple nit-picky items. I wish the pedal wasn't black. It has a super-shiny plexi panel over the top and being black it shows scratches and fingerprints really badly. Like I said, nit-picky! I'd also prefer if the input/output jacks were on the backside of the pedal instead of the left/right sides; that configuration works better on my pedalboard. On my wishlist: It would be wonderful if the Snarl function were footswitchable! I'd be willing to sacrifice more pedalboard real estate to accommodate the wider pedal in order to get that! 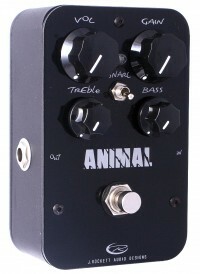 Anyway, the Animal is now my go-to overdrive/distortion pedal. I'm predicting a long reign for the new champ. I chance to own the Animal ... and I totally agree with you ............ the sound is just AMAZING !